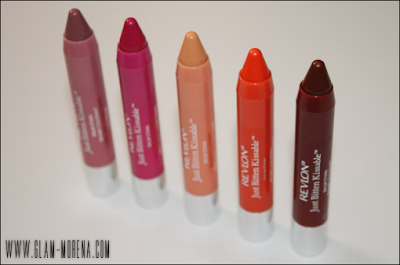 Glam Morena: Swatches: Revlon Just Bitten Kissable Balm Stains. 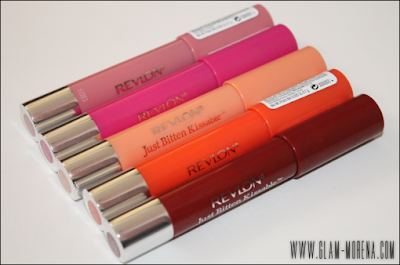 Swatches: Revlon Just Bitten Kissable Balm Stains. 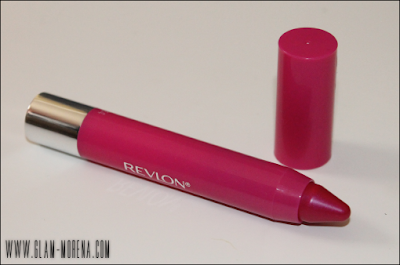 Revlon has come out with several new products within the past couple months, which include the new Revlon Just Bitten Kissable Balm Stains. I decided to get a few from Ulta during a bogo sale. 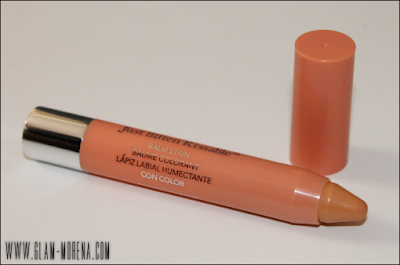 These are similar or dupes for the Clinque Chubby Sticks and the Tarte LipSurgence. 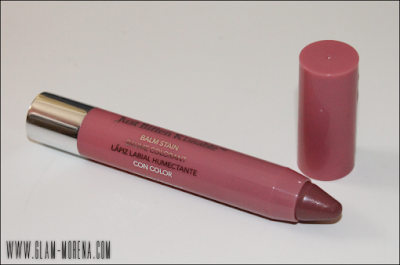 Description: It’s a pampering balm fused with a lightweight lipstain in an adorable chubby crayon. Just Bitten Kissable Balm Stain gives softer, smoother lips with a perfect flush of color that lasts hour after hour. The gel formula comes in 12 vibrant shades that match any look or mood. Retail Price: $8.99 - Price will vary depending on location. My First Impressions & Thoughts: So far I'm really like these Balm Stains! I don't own any other stain lip products besides these. I like that these come in crayon form rather than pen formula like they normally do. The price is a bit higher compared to other Revlon lip products. The positive thing about that is that they are cheaper than the high-end or department store dupes. There is no sharpener needed because they are retractable. Revlon Just Bitten Kissable Balm Stains have a minty scent. It doesn't irritate me or my lips. These come in a variety of colors and finishes. Some have cream finishes and others do contain a little shimmer. 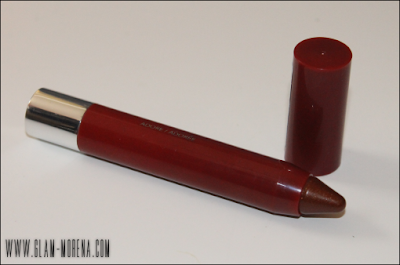 The texture is creamy and leaves a glossy finish once applied. Within a few hours that glossy shine will disappear and there will be a stain of color left on your lips. Swatches of the Revlon Just Bitten Kissable Balm Stains! Lip swatch of the Revlon Just Bitten Kissable Balm Stain in Honey. Lip swatch of the Revlon Just Bitten Kissable Balm Stain in Lovesick. Lip swatch of the Revlon Just Bitten Kissable Balm Stain in Charm. Lip swatch of the Revlon Just Bitten Kissable Balm Stain in Rendezvous. Lip swatch of the Revlon Just Bitten Kissable Balm Stain in Adore. 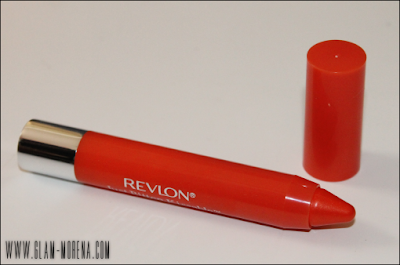 Have you tried the Revlon Balm Stains? Thoughts? Favorites? Those look good!! I don't own any lip stains yet - time to change that!! I saw these in the stores and I wasn't sure that they will look good on me but they look pretty great on you so I think I will give them a try. heard about these from itsjudy time i need them!! !